Spain's prime minister has put Catalonia on notice that it could impose direct rule on the region. 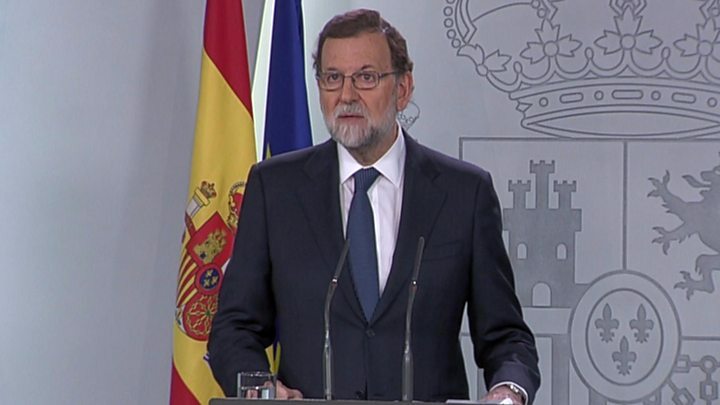 Mariano Rajoy said his government had asked the regional government to clarify whether or not it had declared independence. The move is the first step towards suspending Catalonia's autonomy under the constitution. Catalan leaders signed a declaration of independence on Tuesday but halted implementation to allow for talks. The government in Madrid has now given Catalan leader Carles Puigdemont five days to say whether or not he has declared independence, Spanish news agency Efe reports. 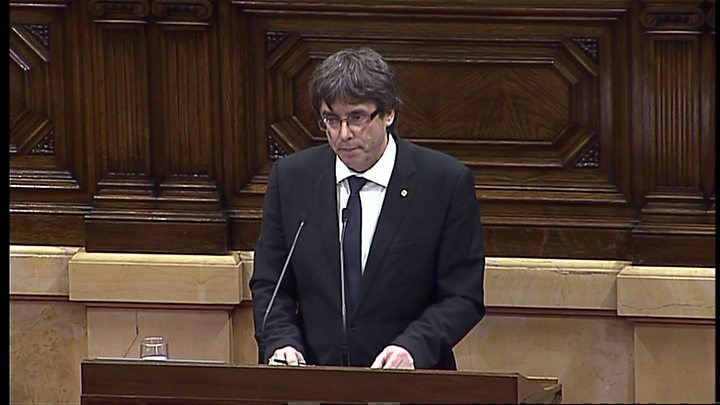 If Mr Puigdemont confirms he has declared independence, he will be given a further three days to withdraw the declaration before Article 155 of the constitution - allowing central government to suspend a region's autonomy and impose direct rule - is invoked, Efe adds. What are the options now? Mr Rajoy accused Mr Puigdemont of having created "deliberate confusion" and said he wanted to restore "certainty". Spain's prime minister tried today to put the ball back in the Catalan court. He's asked the Catalan president to clarify if he is making a declaration of independence or not. There is no official timeframe for the response, although political sources and Spanish media are now talking about five days (and then there is an argument about whether that includes the weekend and Thursday's national holiday). Prime Minister Rajoy has threatened to use Article 155 if Catalan independence is declared but the article has not yet been activated. Reports in Spanish media suggest that if the Spanish prime minister activates Article 155 in the absence of a response from the Catalan president, pro-independence parties in the Catalan parliament will then declare independence. He urged the international community to recognise Catalonia as an "independent and sovereign state". Catalonia is one of Spain's wealthiest regions but a stream of companies has announced plans to move head offices out of the province in response to the crisis. Video Catalonia vote: Yes or No?